In 1969 I was a Navy Corpsman assigned to Alpha Company, 1st Battalion, 4th Marines in Vietnam. The week of March 25th 1969, Alpha was ordered to assist Delta 1/4 which had captured LZ Argonne near the border with Laos. Delta was being sniped at by an NVA .51 caliber machine gun and 82mm mortars. The morning of March 25th Alpha began moving down into a valley towards a high point where it was thought the NVA weapons were located. Within a very short period of time Alpha ran into what might have been an NVA base camp and a furious firefight broke out. At some point during the firefight I picked up a discarded NVA battle dressing. I put it in my pocket. After things settled down I put the NVA battle dressing on my helmet under the elastic band. I told my Marines that I had 50 battle dressings to use on them if needed, but if I get hit use this on me. 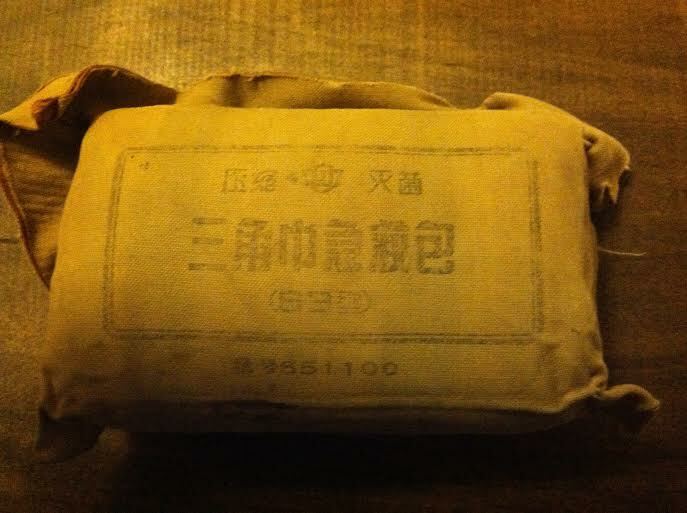 The battle dressing appeared to have Chinese writing on it. I carried it on my helmet for the rest of my tour. It became my good luck piece and I came home without a scratch. Not really, but none from enemy action. Thirty-five or so years later I have two step-sons who became Marines. The younger of the two received orders for Afghanistan, while home on leave I took the Chinese battle dressing out of our display case, wrote on it where it came from and handed it to him for “luck”. 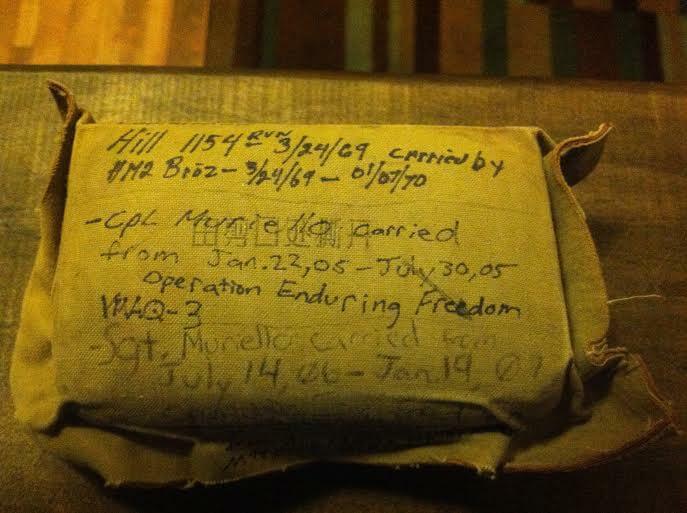 He returned and gave it back, only to receive orders to Iraq a few months later. Once again the battle dressing went to war. Again he came back and returned it. Sometime later his older brother received orders to Iraq and the battle dressing made it’s fourth deployment and again was returned.